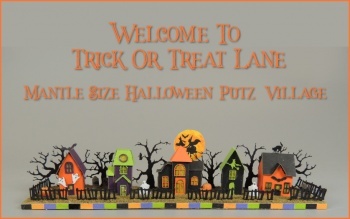 We've done these little putz lanes for Christmas and Easter, and your response was wonderful, so we decided to try our hand at a Halloween village, and I have to say that this is my favorite of ALL! Bright and whimsical, this display can stand alone or be added to a scene. Parts are made out of laser cut and scored cardstock. NO painting is needed. Assembly is tiny and fiddly, but very simple. All houses are displayed on a wood base covered with landscape foam. All houses and landscaping items are included. Best of all, look carefully and you will find a busy little pair of ghosts, a trio of pumpkins and some spooky tombstones, all of which have been 3d printed. I did not light this village, however instructions are given to light if you wish. To do so, purchase the lighting kit shown with the christmas putz houses and remove one chip. Requires glue, scissors, Xacto knife.